The Search & Replace window is a powerful way of finding actions and also changing text in a number of actions at once, regardless of which property the text occurs in. Launch the Search & Replace window from the Edit menu, or with the keyboard shortcut Ctrl+F. Search: Enter the search term to be searched for. Case sensitive: If selected, BOOK will not match book. Whole word: The search string must not appear as part of another word: book will not match mybook. Regular expression: If selected, the search term becomes a regular expression. For example, b. *k would match book. 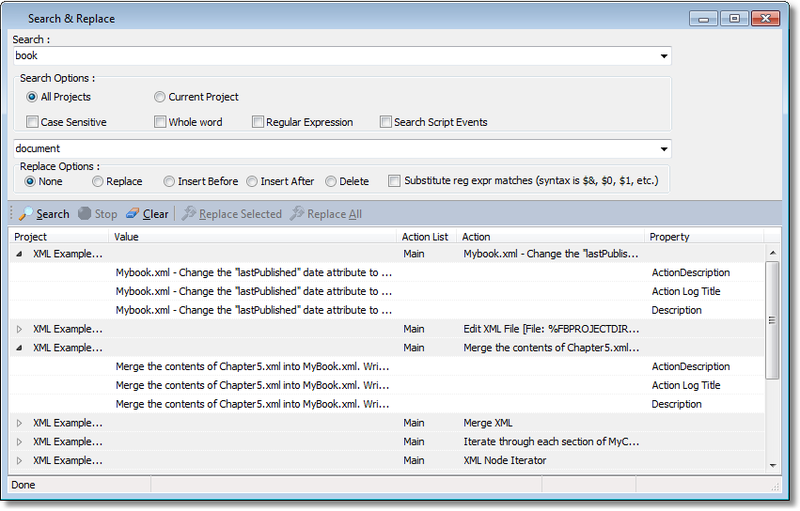 Search Script Events: If selected, the text of script events on actions is also searched. This is important if renaming a variable, for instance. Press <Enter> or click the Search button to search for your specified term. For each match, the action list, action, property and value are shown. Note that a single action usually matches several times, because the string is contained in the title, the log title, and so forth. Double-click on a match to highlight the action in the Design & Debug window. You can then use the keyboard shortcuts F3 and Shift+F3 to move forward and backward through matches. Stop: Aborts the search, if it is taking too long. To replace matches, first perform a search as above. Replace: The string that search matches will be replaced with. • None: No replacements can be made. Functions as a sort of "safety catch". • Replace: Replacements will be made as normal. • Insert before: Replacement text is added before the search text. • Insert after: Replacement text is added after the search text. • Delete: Search term is replaced with nothing. • Substitute regular expression matches: If using the "regular expression" search option, use this option to allow subexpressions to be substituted. • Replace Selected: Select the matches you wish to replace first. The replacements are made, and the matches removed from the list. • Replace all: All matches are replaced at once. • Search for "rm (. *).txt" with Regular Expression flag on. • Replace with "del $1.xml" with Substitute Regular Expression Matches flag on. • A match such as "delete file.txt" will be replaced with "del file.xml"